This Cherokee Medical Scrub Top has a colorful Butterfly Print. Available in many sizes. This Cherokee Medical Scrubs Top has the Caring for the Cause Print. Available in many sizes. This Cherokee Medical Scrub Top comes in a Hello Kitty Print. Many sizes available. This Cherokee Medical Scrub Top has a BOBA Print. Available in many sizes. This innovative top features stretch side panels in contrast knit which shapes and slims the body. 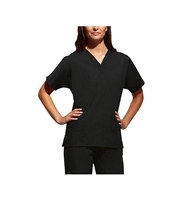 Cherokee Short Sleeve Unisex Medical Scrub Top Dolman sleeve, v-neck tunic with side seam vents, two patch pockets and a cell phone pocket.